An acrimonious split has developed between Brussels and EU ProSun, an alliance of solar panel manufacturers, after EU Trade Commissioner Karel De Gucht announced a ‘targeted and innovative’ settlement to a dispute with China. Angry solar panelmakers blasted the proposal as “unbelievable, unacceptable and completely against European interests,” vowing to take their case to the European Court of Justice when they received confirmation of the deal, probably next month. “I think they have no case,” De Gucht told a news conference in Brussels on Monday (29 July). The trade cease-fire was welcomed by the European Photovoltaic Industry Association which has remained neutral in the spat, reflecting the sometimes diverging interests of its ‘upstream’ and ‘downstream’ members. The squabble began when Brussels imposed a 47% tariff on Chinese solar panels after a complaint by EU ProSun that their Chinese counterparts pocketed huge state subsidies last year, allowing them to dump €21 billion of below-cost solar panels in Europe. So far this year, more than 30 European solar companies have been forced into insolvency, redundancies, exiting the solar business, or selling to foreign investors, EU ProSun contends. But after six weeks of talks, the Commission says that it has negotiated a deal that will raise the prices of 70% of Chinese solar panel suppliers to Europe and allow a 47.6% tariff to be imposed on the rest until 2015. Milan Nitzschke, president of EU ProSun, whose complaint had spurred Brussels to act, accused the bloc of caving in to 'gangsterism' in Beijing. “We know that China threatened a lot of weak southern and eastern EU member states with the withdrawal of investments or the stopping of loan financing, unless the tariffs were ended,” he said. The EU's decision had been bent by hardball negotiating tactics involving ‘rude provocations’ such as walkouts by Chinese negotiators, Nitzschke said. He argued that after setting out its stall for a low minimum solar panel price of €0.67 per watt, Brussels came down to a €0.56 figure, much closer to China’s opening gambit of €0.50. Underlining the division between the erstwhile allies, it was reported on Tuesday (30 July) that Brussels was investigating Europressedienst, a Bonn-based consultancy and source of statistics used in EU solar panel analyses, for providing false and misleading data. Information from the firm, which has previously worked for EU ProSun, is cited 23 times in the European Commission’s June 4 ruling that imposed anti-dumping tariffs. At issue is the extent to which the Europressedienst data exaggerated the ability of European solar panel manufacturers to meet demand in the EU, and underestimated industry's need for imports. The trade commissioner's spokesman, John Clancy, confirmed to EURACTIV that earlier this month, EU officials mounted a spot check of the company. But he denied that this was unusual. "To be clear, the Commission is not carrying out an ‘inquiry’ into Europressedienst, it simply carried out a verification visit, as it does with other companies and as is normal practice in anti-dumping investigations," he said in emailed comments. The firm's data were only used for ‘macro’ and not ‘key’ indicators, Clancy said. The latter included sales prices, production costs and profits that were collected through Commission questionnaires and showed clear evidence of dumping and injury. “Hence, the [anti-dumping] case does not stand or fall with the figures provided by Europressedienst,” he argued. A separate anti-subsidy inquiry into Chinese solar panels is also ongoing, although De Gucht has said that the anti-dumping agreement will be “translated” into it. But any thawing of relations between Brussels and Beijing still has clear limits. “I don’t think that condition is present at this moment in time,” he added. Speaking to journalists at a press conference on Monday, Trade Commissioner Karel De Gucht said: “I believe that this solution will remove the injury for European industry. It is equivalent to imposing provisional duties for all Chinese exporters. The effect will be that the European industry will have the space to regain its previously held market share. We restore stability with a sustainable price level in the European market. 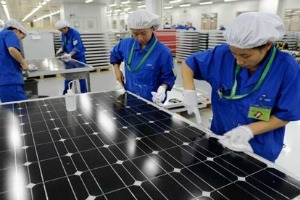 The European Commission launched an anti-dumping and anti-subsidy investigation against Chinese solar manufacturers, after European solar manufacturers lodged complaints alleging that Chinese rivals were benefiting from unfair subsidies. But while European and US solar technology manufacturers would welcome such action, installers and prospective purchasers of solar technology are increasingly concerned that such a move would drive up the cost of solar panels, leading to a slowdown in the deployment of the technology and job losses across the industry. The FT had a rather good article on this issue. The bottom line? – in Dec 2013 member states would have voted on the final duties & de Gucht was facing a lost vote mainly because Angie faced problems with the Euro67bn exports from Germany to China. The Chinese played the Euros like a Strad’ . It will be interesting to see the next industry to get rolled over by the Chinese – wind turbines maybe – although Sinovel seems to have retreated from Europe. Whilst some applaud low cost Chinese environmental products – the environmental costs of producing such products tend to be glossed over – oddly orgs such as Greenpeace have produced reports on the impact on Chinese people and their enviroment of non-applied Chinese environmental legislation. Still, a little bit of hypocrisy never did anybody any harm – did it Mr Singer?